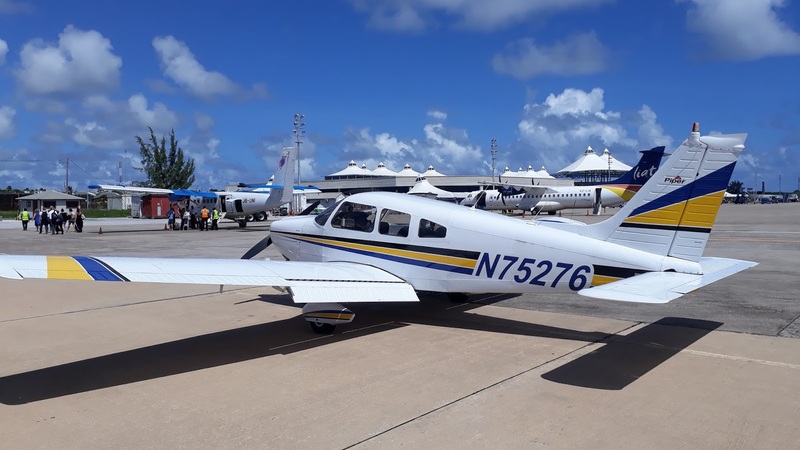 Eric and Ruth, with the private jets at Barbados airport. 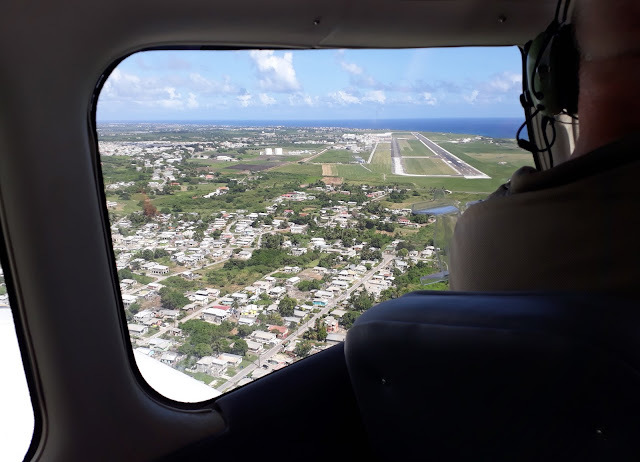 We headed up the west coast towards Bridgetown. Hey, there's the building we're staying in! (Circled in red). 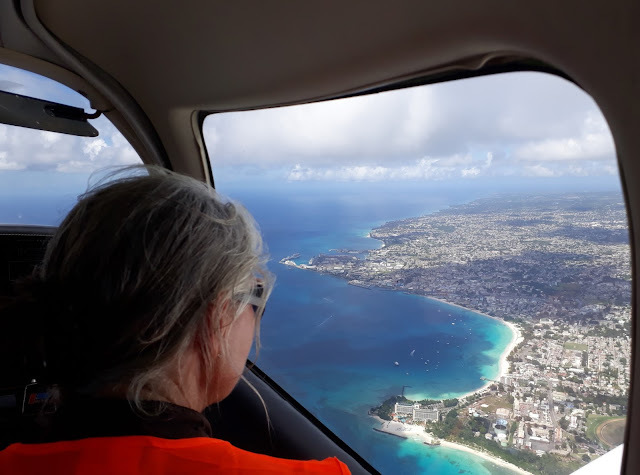 Ruth, looking down at Carlisle Bay and Bridgetown. You can see the horse racing track at the Garrison. There were five cruise ships in port! Looking down at the cruise ship port and the city of Bridgetown. 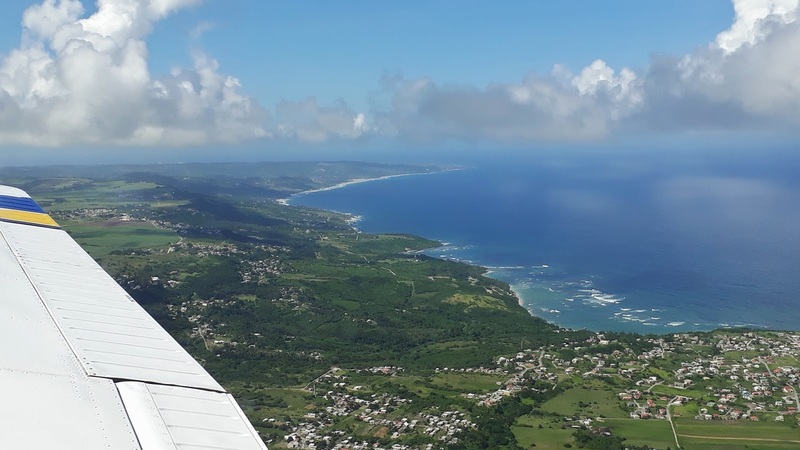 The west coast, with Holetown, and Speightstown. We're going for a hike along this part of the coast today! 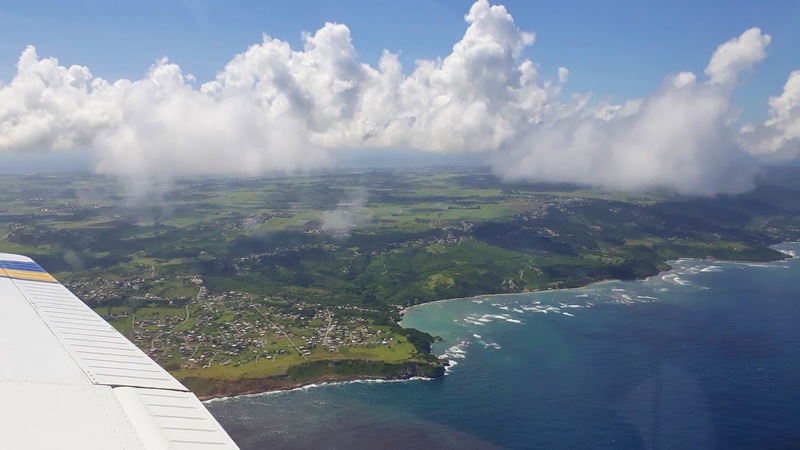 The more undeveloped east coast. We walked a lot of this section the other day. Hey, there's Bushy Park Racetrack! That's where we did the go kart racing! Coming around for our approach to landing. And, I recorded our landing for you as well! Our flight map. We were in the air for about 35 minutes, and we did 105 kms (65 miles). Well, that's something not everybody gets a chance to do! 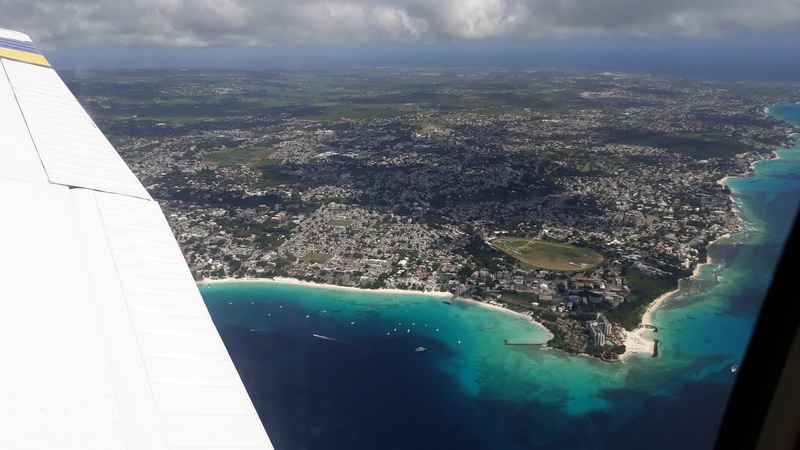 It sure gives you a different view of Barbados. Thanks for taking us up Eric! Well, 19 days in Barbados has gone by pretty fast, hasn't it? Today is our last day of exploring and we haven't made it up to the north end of the island yet, so today is the day for that. We're trying to get an early start because I think we'll be putting a few miles on our hiking boots! Enjoy your last day and the north end. What a great airplane trip! Wet and warm on Cozumel. Safe travels. Hopefully you aren't too wet on Cozumel! 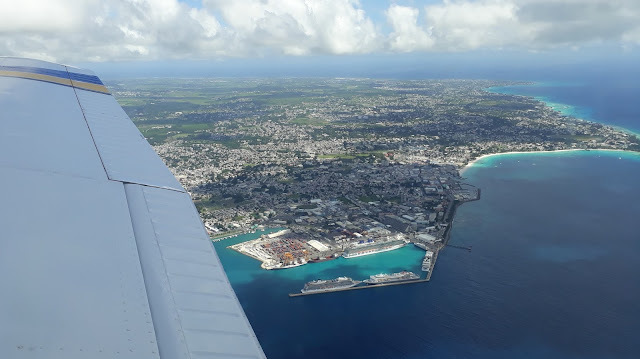 Have too much more fun , what a treat it was for the flight around the island too. It was definitely a treat and we thoroughly enjoyed it. We were on a similar plane in the Yukon and flew through a mountain pass. Very exciting! That would have been exciting. Kevin and I had both forgotten that you were up in a small plane there. Yep! Not many people have a chance to do that couchsurfing or even when they aren't couchsurfing. What a fantastic way to end our holiday here. I used to go flying like that quite a bit with an uncle of mine, lots of fun. Enjoy the hike! You were lucky to have an uncle to go flying with. It is so different than being up in a big plane. We had a great hike. It was a great way to see things. Our host said we have seen everything there is to see now because we have been under, over and on the island! Never knew you had your own plane, that would have been so neat to be able to go up in it when ever you wanted too. We haven't forgotten about you being in Texas, we will keep our eyes on your blog and hopefully our paths will cross once again. Thank Eric for us! It was a treat for us, too. When we finally get back to Barbados, we will also take him out to lunch for allowing us to take his flight vicariously through you and Ruth. We will pass along your thanks Dee! Great flight and sights! I gave flight lessons in that model when it arrived new at the flight school, great little plane. Thanks Chuck and Anneke! We really enjoyed being able to see the island like that, it certainly made our stay here memorable.